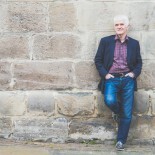 ‘Lowry is easy to disparage,’ he writes, ‘so let me immediately draw attention to his virtues.’ He starts by acknowledging ‘his strong sense of pattern and colour’, but by the end of the paragraph he is telling us that Lowry ‘found it difficult to master shadows so he simply left them out’. 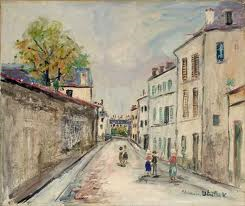 I quite like Utrillo. Silly me! Oui, c’est vrai. 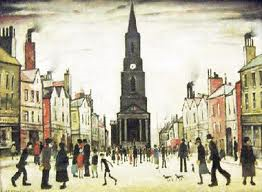 Lowry was a rent collector. He painted in his spare time. If Baudelaire’s judgement was flawed, what chance was there for Lowry? The art critic’s last word on the matter is reserved, not for Lowry, but for the curators (who are, by the way, ‘a couple of outside curators, who admit that they know little about their subject’) and their exaggerated claims for Lowry’s worth as an artist. The word he chooses is ‘phoney’. Lowry drew outdoors (‘Most of the drawings are dreadful,’ we are told) and painted at home working by overhead light (one reason, we are told, ‘why his urban scenes look uniformly bland and devoid of atmosphere’). It sounds like cave painting to me. The artist leaves the cave to look at the landscape and its inhabitants, then goes back inside to draw them on the walls. Not to show the others what it’s like outside, they know that already, but rather for the pleasure they get from looking together at what they already know but had never really thought about. Cave painter, story teller, poet, it’s all the same. But that’s the point. That’s what the people in Lowry’s cave saw when they went out. Their own experience and their own times. Flat, shadowless, unchanging, unemotional. It’s grim up north, Frank. You should get out more. What puzzles me is what he says next. ‘I have no idea why that should be so moving.’ What else would move us in a work of art – a painting, a story, a symphony, a ballet – if it were not what it reveals about what people do? It’s the job of the cave painter, the job that every artist does. Even if the day job is rent collecting. Find out what I’m reading now in my Diary. This entry was posted on September 4, 2013 by Neil Rathmell in Uncategorized and tagged art, baudelaire, frank whitford, john barrell, lowry, tate britain.